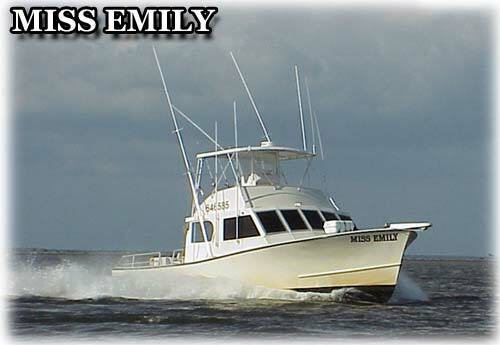 The "Miss Emily" is a 45' with twin diesels, air-conditioned and all the comforts of home. She makes good speed and has a huge deck area capable of fishing 6 very comfortably. You bring your eats and drinks. We supply everything else. Bottom fishing offshore of Apalachicola is always productive, with grouper, snapper or amberjack being the main targets. You may also catch king mackerel, Wahoo, dolphin, tuna, cobia or even sailfish on a flatline or by trolling. Give us a call and lets get you hooked up with a professional crew for a great day of fishing. (850) 653-8055.